The best performing currency today was the Australian dollar which traded sharply higher against the greenback. As a high beta currency, it is not unusual to see AUD trade well when stocks recover, especially after the deep slide that it experienced over the past 2 weeks. Gold, iron ore and copper prices are also up across the board providing additional support to the currency. We think further gains are likely up to at least 78 cents. AUD/JPY in particular should see continued gains as USD/JPY appears be finding support above 108.50. Although the Dow came off its highs, it still managed to end the day up 400 points, which is a significant recovery. 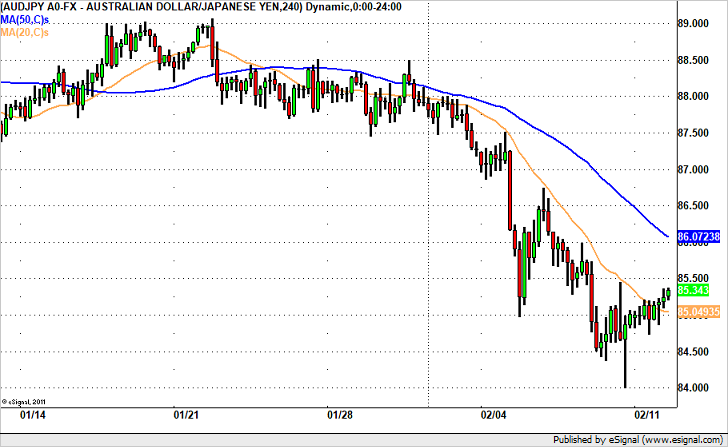 Weekly, daily and 4 hour charts show a potential rally up to 86.00 as long as AUD/JPY holds above 84.70.